The asphalt on your driveway goes through a lot during the course of a year much less its lifetime and that is especially true here in Central Pennsylvania since we have all four seasons. From hot to cold and everything in between the weather can beat your asphalt driveway up. Throw in normal wear and tear from everything that goes on top of the asphalt and the need to repair it will be inevitable. So, does your asphalt driveway need repairs? If your driveway is settling or cracks are forming then a repair will be needed. Here are our favorite driveway maintenance tips. There are typically two things to look for. The first is that your driveway is settling. When this happens the base underneath the asphalt layer has gone bad and the end result is that your driveway has a wavy or uneven appearance. With the ground freezing and thawing, this is common in northern states like Pennsylvania and there are a number of other reasons that this happens from poor installation to a sinkhole to driving over it with a heavy vehicle. Underneath the asphalt is a layer of stone which forms a solid foundation and like your house, your driveway needs a solid foundation to stay strong. If the foundation is damaged what is above it will not hold up and the settling your driveway is doing is the result. To fix this issue the damaged section must be cut out, repaired and repaved. When the damaged section is ripped out the cause of the problem can be determined and in most cases rectified. The other thing to look for is cracking on the asphalt. Cracks are mostly caused by water and in most cases can be easily fixed. Cracking is a sign of age and it is only going to get worse as time goes on so fixing the issue early can save a lot of hassle later on. Dirt and water will work their way into those cracks. In the winter time, that water freezes which will cause the cracks to expand and dirt and soil will fill in those spaces. Many people just put a patch that can be purchased from a home improvement store overtop of a crack but this will not fix the issue as the patch will eventually crack as well. The crack must be cleaned out and a seal can then be put in by a professional service like Willie’s Paving making a much more permanent fix. A typical asphalt driveway has a lifespan of between 12 and 15 years here in Central Pennsylvania. 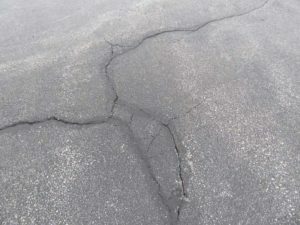 If you are seeing settling or cracking with your asphalt driveway ask yourself how old it is. It may be more beneficial to have the entire driveway resurfaced rather than repaired. Fixing it may be easier on the wallet now but a rebuild will be necessary at some point so you may be just delaying the inevitable. Symptoms like cracking and settling are your driveway’s way of telling you it may need to be replaced so if you live in the Harrisburg, York or Carlisle areas and need repairs or if you need your driveway replaced give Willie’s Paving a call and we can help you out.